In my last article the Quest for Financial Freedom and the Science of Getting Rich, I made mentioned that there is a science behind getting rich and that science is doing things in a certain way that guarantee riches with mathematical certainty. I also mentioned that I will reveal one of the ways you can do things in this our digital age that guarantee your financial freedom in no distant time. That certain way I will talk about in this post is Bitcoin. In case you don't already know, bitcoin is ruling the financial world. As at the time of writing this article, 1 bitcoin was exchanged for more than $8,500 (i.e. more than Eight Thousand Five Hundred US Dollars). Imagine if you have just made 1 bitcoin in one month here in Nigeria, that is more than a million Nigeria monthly. How many jobs can you do here in Nigeria that you can earn up to that in a year let alone a month? So, if you are ignorant of how to earn bitcoin online here in Nigeria, then you are missing out greatly. 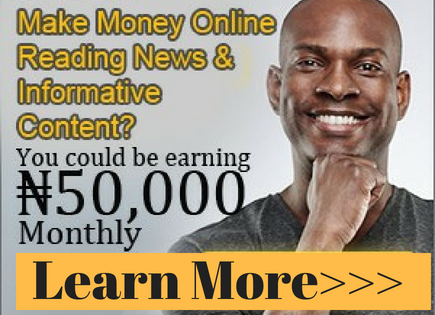 But thank you star in landed on this web page because I'm going to show you the exact methods I used to earn free bitcoin online on a daily basis. How much you can earn depends on your commitment. Before I go into the details of what I have for you today, let me give you a brief introduction about bitcoin for those who are totally ignorant about this financial freedom opportunity. Bitcoin is a digital currency, a cryptocurrency used as a means of payment system introduced in 2009 by a leading developer in the person of Satoshi Nakamoto. It is an open-source software in which the payments in the system are recorded in a public ledger using its own unit of account called bitcoin. There are smaller units of bitcoin just like you have a smaller unit of every currency of the world such as Naira has kobo as one of the smaller units. As an example, Satoshi, named after the developer is one of the smaller units of bitcoin, dogecoin, litecoin, litoshi, dashcoin are also all units of bitcoin. Transactions with bitcoin work peer-peer without the need for a central repository or a single administrator and this has led the United States Treasury call bitcoin a decentralized virtual currency. Just like you can spend dollars in almost any websites, you can spend bitcoin also. Although its status as a currency is often disputed, as a result, media reports often refer to it as a digital currency or simply cryptocurrency. Bitcoins are created as a reward for payment processing work in which users offer their computing power to verify and record payments by a processing called mining, into the public ledger. Individuals or companies can engage in this activity called mining, in exchange for transaction fees and newly created bitcoins, like I wrote in one of my previous articles about a company engaged in this activity, the company called EarnMoney. Check the previous where I talked about How to Make Money with Your Computer Idle Processing Power. Besides mining, bitcoins can be obtained in exchange for fiat money, products, and services. Users can send and receive bitcoins electronically for an optional transaction fee using wallet software on a personal computer, mobile device, or a web application. Bitcoin as a form of payment for products and services has seen growth, and merchants have an incentive to accept the digital currency because fees are lower compared to the 2-3% processing fees typically imposed by credit card processors. However, the European Banking Authority has warned that Bitcoin lacks consumer protections because, unlike credit cards, any fees are paid by the purchaser, not the vendor. Another drawback is that Bitcoins can be stolen and chargebacks are impossible. I think that is one reason why the commercial use of bitcoin is currently small compared to its use by speculators, which has fueled price volatility. Anyway, this is a tutorial on how you can earn free bitcoin on a daily basis so you can attain financial freedom in no distant time. If you want to learn more about the details of what bitcoin is all about, a simple Google search will help. 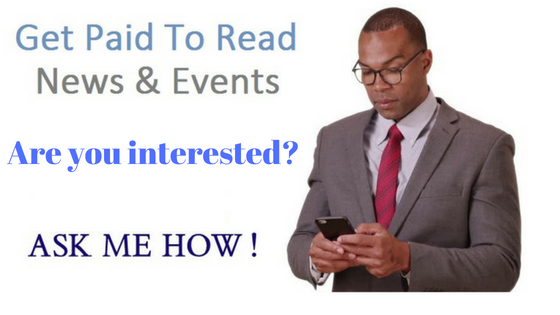 So, let's dive in right away to how you can earn free bitcoin online daily. By the way what is Bonus Bitcoin? Bonus Bitcoin is a completely FREE bitcoin faucet that can pay you up to 5,000 satoshi every 15 minutes. Also, at the end of each day (around midnight in the country where the faucet is hosted) you will receive an automatic 5% bonus added to your current account balance - provided you made at least one faucet claim during the previous day. As of 6th July 2017 all payments from Bonus Bitcoin are automatically made instantly and directly into your CoinPot account. Remember, you must create a coinpot account before you start claiming from Bonus Bitcoin Faucet. As stated above, Bonus Bitcoin is a website where you visit daily to claim unit of bitcoins every 15 minutes. Permit me to call it a repository of units of bitcoin. This repository is called faucet in bitcoin or cryptocurrency terminology. You need to visit the faucet daily every 15 minutes to claim your free bitcoin. You can claim as high as 5000 satoshis per claim, however, the average claim as the time of writing this article is 6 satoshi per claim. After a claim, you wait for 15 minutes before you can claim another one. You may say, 6 Satoshi is too small, yes you are not far from the truth, but there are other ways you can increase your earnings on the platform as I will reveal shortly. Also, there are some other faucets I will be writing about in days to come that gives you far more than this. What you simply do is to head over right away to coinpot.co, create an account (free of charge) where the bitcoin you collected from Bonus Bitcoin can be deposited automatically. Once you've creaed your coinpot account, you can go back to Bonus Bitcoin where you can start claiming units of Bitcoin every 15 minutes. To speed up your earning, grab your affiliate link and share it with as many friends and family members as possible. Encourage and teach them how to create account and start claiming units of Bitcoins like you are doing. Bonus Bitcoin will give you 50% of all their claim depsosited instantly to your coinpot account. How much can I earn from Bonus Bitcoin? 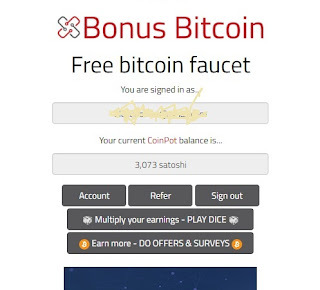 According to Bonus Bitcoin, they aim to be one of the highest paying bitcoin faucets around! So to ensure that their claim amounts are kept as high as possible, they automatically adjust the rate based on a number of factors including the BTC v USD exchange rate and their advertising income. Remember, they are giving you this Bitcoin because you visit their website to view ads, the income paid by the advertisers is what's shared with you as Bitcoin. Currently, you can claim up to 5,000 satoshi every 15 minutes. Once you register and sign in you will be able to see what the current average rate is per claim. You also have unlimited potential to increase your earnings by using their referral scheme which pays 50% lifetime commission from all that you referred to them and are also working hard by claiming their bitcoin units every day. As their name implies, they also run a variety of ways to boost your earnings through their Bonus schemes - along with frequent special promotions and competitions. The best way to keep up with this is to like their Facebook page or follow them on Twitter (as the buttons are given on their websites) where any news is first announced. Their current bonus scheme as at the time of writing this article pays a daily 5% bonus of the total of all faucet claims and referral commission earned over the previous 72 hours (3 days) - providing you make at least one faucet claim during the previous day. You can increase your earnings exponentially by participating in offers sponsored by Bonus Bitcoin. These offers include Super Reward Offers, where you get to participate in surveys to get paid in bitcoin units, Wannad Offers, where you also participate in surveys, perform simple tasks such as surfing websites, watching videos, etc. Offer Daddy where you can also participate in simple tasks, and lastly, Offer Toro where you can download and install simple apps or play games on your mobile phone and receive units of bitcoin in return. Once you're logged on to Bonus Bitcoin, you will see an interface as shown in the screenshot below. You will need to fill the media Recaptcha to prove that you're not a robot but human. The media ReCaptcha is indicated in a red box in the image below. Enter the text that is displayed correctly to prove that you're human. After entering the text, click the "Claim now" button and wait for the faucet to give you the number of satoshis that it has accumulated. Sometimes the media Recaptcha may not work and you'll have to switch to Google Recaptcha by clicking the link indicated in a green box in the image above. You can make as many claims as possible in a day. You'll only have to wait 15 minutes between each claims. The more you claim the more your token will grow in your coinpot wallet. So, you can claims as often as possible. What has happened if you cannot make faucet claim? If the Bonus Bitcoin faucet detect that you have blocked adverts or they aren't showing up in your web browser then the system will prevent you from making a faucet claim. If any adverts are not showing then there must be something blocking them on your browser/device. This may be an ad-blocking browser plug-in or extension - if so, please disable your ad-blocking browser plugin/software or add the faucet page to the exception list. Their faucet web site is designed to work on the broadest range of web browsers and devices possible. However it may be that your browser/device is not supported and you receive an error message when you try to claim. If so, please try a different browser or device to check that this is the problem before contacting the Bonus Bitcoin Support Team about it. You can watch this video here to learn more about Bonus Bitcoin. Sign Up right away and start claiming your bitcoins. Remember 1 Bitcoin is exchange at over Eight Thousand Five Hundred US Dollars at the time of writing this. If you are serious you can make up to 1 Bitcoin or even more in a month. Sign Up Now.